It’s fitting that I begin my blog anew on this “new” Holistic Geek website, on the very day that I begin..again..the yoga practice that I just love. I love it, but I struggle to keep at it. 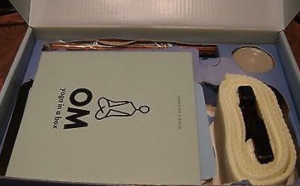 Even after all these years, I go back to my “old stand by” of Om Yoga in a Box, by Cyndi Lee (2001). You see, I’m very much a nostalgic person. I love to sing the songs I sang at my college recitals. I look for that original green Nature’s Gate Herbal Shampoo on the web from years ago. And, I recently jumped with glee when I found that Barnes and Noble was selling new releases of the original Star Wars vinyl soundtracks. I love “getting back to basics” in so many aspects of life. It’s comforting, because I feel I’ve tapped into something “timeless” that allows me to take a breath, slow down, and reconnect when the world around me spins forward at a trajectory seemingly out of my control. I need my ‘happy places’ with these crazy things – maybe to stay grounded and sane when the world feels so out of control. Back to yoga though. I discovered Cyndi Lee and OM Yoga in 2005, and at that time I was living in Northfield, Minnesota, in a small yet contemporary 2 bedroom condo that I bought for a steal. 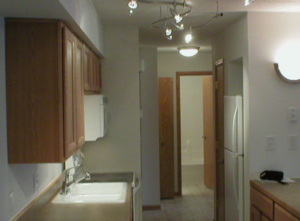 My first home – a cozy 874 square foot lower level unit – with curvy L.E.D. track lighting, an open kitchen, stackable washer-dryer, my room, and the spare bedroom to do Reiki, massage, or meditation. It was cozy. Basic. Peaceful and calm. I kept up with OM Yoga’s progression of beginning to more challenging sequences for about 60 days, and wound up losing about 35 pounds. Guys on my softball team wondered how I’d lost weight so fast. My parents came to visit, and my mom’s first word were “You’ve lost weight!” I hadn’t really noticed it until they mentioned it. I simply “grew into” new poses and a new mindset. The weight loss followed. What’s interesting NOW in speaking about starting again – Day 1 – with my yoga practice, is that I’m arriving full circle from that time in 2005. In 2008 my condo foreclosed during the housing bubble and the economic downturn. My partner and I moved around a bit throughout Minnesota, and I went from being a full-time technology consultant to a massage therapist, then along the way a web designer, and now a meld of web consultant and coach for solo businesses. Most recently, however, I went through a divorce from a partner of 11 years, who I thought would be the love of my life. I’ve gone through lots of hell and lots of healing in the last year, and as I continue moving on, ironically, tomorrow I will travel back to Northfield, Minnesota – to hopefully sign a year lease on an apartment – back in the cozy town I loved but have not lived since 2008. It’s day One, but it’s the start of a re-commitment, and a re-connecting to a past love, into an environment and surroundings I find oh so healing and peaceful. The challenges are high (I’m as heavy as I was previously before losing weight – I have a distance to travel indeed! ), and yet the opportunities are now massive (I feel I’m at the top of my game with my business these days). It’s a second chance, another ‘go-round, and yet a new awakening. I’m sharing all of this here because, like many solo practitioners, business owners, and fellow dreamers, we all experience joys, setbacks, hurts, fears, and often the roller coaster ride with our own self-esteem. After more than ten years of ‘solo-preneuring it’, I’ve been there. I got the t-shirt, and then the t-shirt either didn’t fit anymore, or it was lost in a box somewhere, or maybe even ‘the dog ate it’ when I wasn’t looking. We all start at Day One, and often we START OVER at Day One, sometimes more than we’d like to admit. Resilience and perseverance pay off in the long run, and if you’re like me, you learn that sometimes you must simply “jump before your net appears” – counting on your years of wisdom and experience to pull you through. We CAN begin again. Take a deep breath with me and sound OM! Day One feels great! I’ll tell you more after days 2 or 3, and if I get that cool apartment! And, welcome to my world by the way! I’ll be sharing more with you soon with this new blog. I plan to have a mix of tech, holistic and coaching tips, and my own reflections on life’s journey. I hope you’ll stay tuned. Thanks for sharing and being so uplifting. Will be looking forward to next blog!